It’s always exciting to have a new book published, and then it’s exciting all over again to see a book take on new life. Today is the “re-birthday” of one of my Flagman’s Folly books, The Rodeo Man’s Daughter. 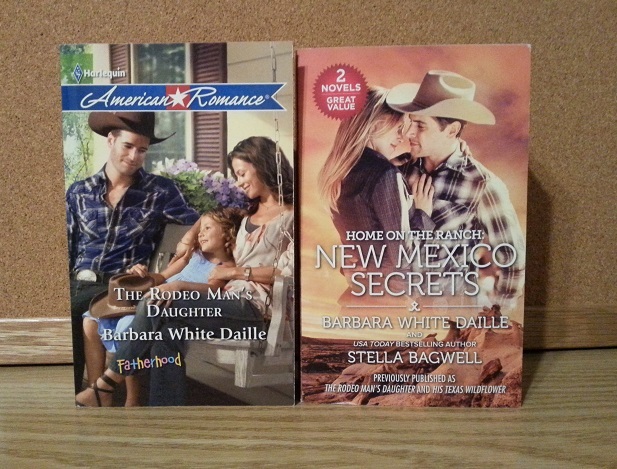 The book is now available in both print and e-book formats, in a Harlequin Special Release 2-in-1 volume called Home on the Ranch: New Mexico Secrets, which also includes a book from author Stella Bagwell. When Caleb Cantrell left home, he never thought he’d return as a wealthy rodeo star. Then an accident destroyed his career—and nearly ended his life. So Caleb goes back to Flagman’s Folly, New Mexico, and his high school sweetheart, Tess LaSalle. But a ten-year-old secret stands between them, one that could hurt everyone Tess loves, especially her daughter…their daughter. Hi, Sue – thanks in advance for the shout-outs! I appreciate them. I’m sorry, too, that you hadn’t seen these books originally. The great news is books can stay around longer now we have both print and e-books. I’m very lucky to have both my publishers make books available in many formats. Thanks again for helping to spread the word and for stopping by to comment!